On Sunday November 8, 2015, Reverend Father Martin Person assumed the rectorship at Saint Herman of Alaska Mission in Sunnyvale, CA. Below is a photo report of that event. Priest Christopher Horsley has been serving in the Western American Diocese for 19 years. In August 1996, he was ordained to the diaconate and appointed to serve at the Holy Resurrection Russian Orthodox Church in Santa Barbara, CA. On October 2, 2015, Protodeacon Nicholai Triantafillidis, a beloved member of the clergy of the Western American Diocese, reposed in the Lord shortly after partaking of the Holy Mysteries of Christ. Father Nicholai lived in this temporal life 3 weeks short of his 45th Birthday. Chosen of God, he labored tirelessly from his youth up to his blessed end in the service of the Orthodox Church. His Eminence Archbishop Kyrill read the following words of condolence Metropolitan Hilarion to the clergy and faithful of the New Cathedral during the funeral of Protodeacon Nicholai Triantafillidis on Tuesday October 6, 2015. A providential meeting in the Vatopedi Monastery on Mount Athos in July of 2014 by Archpriest Alexei Yastrebov. First published on the author's Facebook page on October 3, 2015. I had heard of Father Nicholai previously from my friend, Father Alexander Ageikin. They were friends, both served the Church as deacons of cathedrals: a work that appears to some as attractive and not very complicated, but in fact is a difficult labor demanding knowledge not only in the realm of liturgical practice, but often including administrative and household skills, huge physical endurance and the “usual” Christian humility. First of all, I would like to thank every single person who came today to help us bury our beloved Papa. It is so very comforting to know how much everyone loved him, so thank you! Being the oldest of his children, I decided it would be appropriate to say a few words about our Papa. The 24th North American Orthodox Church Musicians’ Conference (ROCM) was a great success that made a lasting impression on the church choir directors, choristers, and readers who participated. The conference was organized jointly by members of the Liturgical Music Commission (LMC) of the Synod of Bishops (ROCOR) and the parish of St. Andrew Stratelites, St. Petersburg, Florida, whose rector is Archpriest Igor Shitikov. The main theme of this year’s conference was “From Generation to Generation: Developing and Strengthening the Musical Tradition of Your Church Choir.” Intensive classes, lectures, and rehearsals were held at the lovely Clarion Clearwater hotel, in the vicinity of the host parish. Priest Martin and Matushka Sarah Person came to Holy Protection Church in Hollywood, CA, a little over 13 years ago (2002). Father Martin was ordained as Deacon there in 2003, and became the priest for the early English Liturgies in 2006. The brief earthly life of St. Jonah of Hankou came to an end in 1925, at the age of 37 years, at the Manchurian station in China. During his time on earth, the saint had occasion to live the equivalent of several lives: that of an accomplished theologian, a confessor, a soldier in the White Army, and a philanthropist, through which he sought the ultimate fulfillment of Christ’s commandment to love one’s neighbor. Since this issue of our magazine is dedicated to the worthy cause of charity, we begin with the life of this remarkable saint. On Thursday the 24th of September, 2015, the famous “Men in Black” Series, sponsored by Saint Elias Church of Diamond Springs, CA, held its latest missionary event in the golden hills of El Dorado County. Though not a “man in black”, we hosted Steve Christoforou to hear him share why he chose Christ. His answers were straight forward and compelling: he chose Christ for the same reason Gandhi rejected Him. He chose Christ because of pain, the very rationale from which so many deny the existence of God. Lastly, he didn’t choose Christ because He’s the best religious idea out there, but because of something far more personal. Steve talks to a largely adult crowd about why the hard choice to draw near to God was the best decision he’s ever made. With sorrow for the tremendous loss for his family and for our Western American Diocese His Eminence Archbishop Kyrill announces the repose in the Lord of Protodeacon Nicholai Triantafillidis which took place this morning, the 2nd October, 2015. Newly-departed Protodeacon Nicholai was born on October 24, 1970. He grew up in San Francisco, California, and was raised in the parish of our Diocesan Cathedral in honour of the Icon of the Mother of God “Joy of All Who Sorrow.” He was a spiritual son of Archbishop Anthony (Medvedev, +2000), who ordained him to the diaconate on the Feast of the Elevation of the Honourable and Life-Creating Cross (September 14/27) in 1992. Father Nicholai served the Holy Church with great love and zeal in the spirit of the famed protodeacons of the Russian Orthodox Church tradition. Sunday October 4: Panykhida at 7:30 pm. Tuesday October 6: Liturgy at 8:00 am. Funeral presided by Archbishop Kyrill at 10:00 am. On 11/24 September, 2015, the day of memory of Venerable Father Silouan the Athonite, His Eminence KYRILL, Archbishop of San Francisco and Western America, consecrated a new men’s monastery for the Western American Diocese of the Russian Orthodox Church Outside of Russia, in honor of this modern-day Saint. CORRECTION TO REPORTS ON DISTURBANCE AT ST TIKHON’S HOUSE, SAN FRANCISCO. On September 8, 2015, the Feast of the Vladimir Icon of the Mother of God, a very special event took place in the life of our diocese. His Holiness IRENEI Patriarch of Serbia visited our Diocesan Cathedral of the Mother of God dedicated to Her Icon “Joy of All Who Sorrow” in the company of many Serbian Orthodox bishops, clergy, seminarians from the theological seminary in Prezren and others. On Friday the 4th and Saturday the 5th of September, 2015, His Eminence KYRILL Archbishop of San Francisco and Western America participated in the canonization of a newly glorified Saint of North America, Saint Sebastian of San Francisco and Jackson. His Holiness Patriarch Irenei of Serbia visited the United States to participate in the canonization and presided over the ceremonies which took place at Saint Stephan’s Serbian Orthodox Cathedral in Alhambra, CA. On September 4th, 2015, His Eminence Archbishop Kyrill arrived in Alhambra, CA, to participate in the Canonization of two Serbian Orthodox Saints taking place at Saint Steven's Serbian Orthodox Cathedral. The glorification of Hierarch Mardarije (Uskokovic) and Archimandrite Sevastian (Dabovic) will take place on Saturday, September 5, 2015, in the Western American Diocese of the Serbian Orthodox Church, as reported by its official website. Leading the celebrations with will be His Holiness Patriarch Irinej of Serbia. Also participating with be His Eminence Archbishop Kyrill of San Francisco and Western America of the Russian Orthodox Church Outside of Russia. 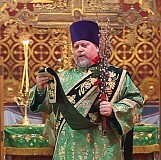 On Sunday August 17/30, 2015, His Eminence Archbishop Kyrill arrived for an archpastoral visit to Holy Ascension Church in Sacramento, California, with the purpose of consecrating the new bells received from the LITEX Foundry in Moscow Russia and the newly-constructed belfry erected by the parish for the purpose of housing them. This celebration was dedicated to the 1000th Anniversary of the Repose of Holy Equal-to-the-Apostles Grand Prince Vladimir the Enlightener of Russia (+1015), and became the culmination of a three-year project as the parishioners worked on design, fundraising and construction. On the 18th and 19th of August, 2015, Holy Transfiguration Cathedral in Los Angeles, California, marked its 85th Anniversary while celebrating the Patronal Feast of the Transfiguration of the Lord. During the Divine Liturgy His Eminence elevated the Deputy Rector of the Old Cathedral, Hieromonk James (Corazza), to the dignity of Abbot in recognition of his dedicated service to the Holy Church. Abbot James labors over a multi-ethnic flock in the Bay Area comprised of Americans, Russians, Palestinians, Romanians… Furthermore, Father receives multitudinous pilgrims who come to venerate Saint John of Shanghai the Wonderworker from all over the United States and the world at large to whom he ministers tirelessly. In addition, many capital improvements have been made to the cathedral church and facilities under the deputy rectorship of Fr. James, including, but limited to, new iconography and sacred furnishings. Congratulations to Abbot James, his parishioners and benefactors with this dignity! On Saturday May 2, 2015, a prayer service and fundraiser banquet was held to raise funds for the construction of a church to house the Iveron-Hawaiian Myrrh-streaming Icon of the Mother of God on the Hawaiian Islands. On April 26, 2015, the Sunday of the Holy Myrrh-bearing Women, a fundraiser banquet was held at the Holy Virgin Cathedral at 6700 Geary Blvd. in San Francisco, CA. The fundraiser banquet was entitled “Joy & Mercy” and organized to benefit benevolent institution in Russia called Miloserdie (Compassion). 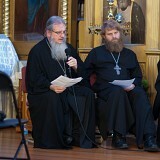 Over the course of many years Miloserdie has tirelessly labored to bring aid and consolation both material and moral to the infirm,..
On the 25 and 26 of April, 2015, His Eminence Archbishop Kyrill visited the Saint Nicholas Russian Orthodox Cathedral in Seattle to mark the 25th Anniversary of the ordination of Archpriest Alex Kotar Dean of the Northern Deanery of the Western American Diocese, who was ordained to the Deaconate on the Feast of the Annunciation by Archbishop Anthony (Medvedev) in 1990. The Iveron Hawaiian Myrrh-streaming Icon of the Most Holy Theotokos is coming to the San Francisco Bay Area on the weekend of May 2 and 3, 2015, which will include visits to both Cathedrals of the Western American Diocese located in San Francisco. The Second Annual "Men in Black" Series was held on the 13 and 14 of February, 2015. 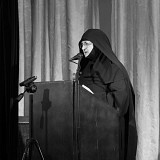 This year's key-note speaker was Sister Vassa (Larin) of the popular weekly program "Coffee with Sister Vassa." Below is a video of her lecture and the questions and answers that followed held on Saturday February 14, 2015, in Diamond Springs, CA. The VIII Annual Lenten Retreat of the Western American Diocese was held at Holy Virgin Cathedral in San Francisco, CA, on March 29, 2015. There was great inspiration and a deepening of faith that accompanied the conclusion of our pastoral retreat, which took place from Monday March 9 to Wednesday March 11. 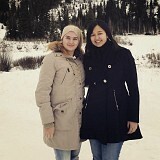 We clergy took some of both home with us to our respective families and flocks. On the 5th Sunday of Great Lent (March 29, 2015), when the Holy Church commemorates the memory of Saint Mary of Egypt, His Eminence Kyrill Archbishop of San Francisco and Western American visited the Los Angeles Area. On Sunday, March 15th, the choir of the Church of All Russian Saints in Burlingame, CA, presented a choral recital of prayers from Great Lent and Passion Week Services. The program consisting of hymns from the Lenten Triodion spanned chronologically from the weeks leading up to Great Lent through Great Saturday and featured works by pre-revolutionary and contemporary composers. The 2nd day of the retreat of the Western American Diocese began with the Lenten Hours, typica and vespers starting at 8:00 am. Preserving the tradition of pre-revolutionary Russia, on Sunday, March 8th, the Holy Virgin Cathedral Choir, under the direction of Vladimir Krassovsky, gave a Lenten Concert of Sacred Choral Music at Star of the Sea Catholic Church in San Francisco. On March 9, 2015, the clergy of the Western American Diocese of the Russian Orthodox Church Outside of Russia gathered under the omophorion of their archpastor and father, His Eminence Archbishop Kyrill, for the first of a three-day clergy retreat. Can a small parish that no one’s heard of influence the notions of a community that assumes monks wear orange? We decided to try by bringing in the “men in black”. 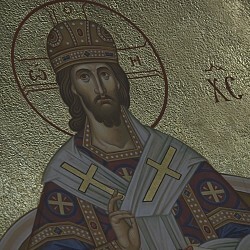 In the Cathedrals, monasteries and parishes of the Western American Diocese the First Week of Great Lent has passed with the chanting of the Canon of Repentance by Saint Andrew of Crete, a doubled reading of the Psalms of David, with fasting, prostrations and confession; and for many, the partaking of the Holy Mysteries of Christ. The annual Lenten retreat for the clergy of the Western American Diocese is being held at the Old Holy Virgin Cathedral in San Francisco from March 9 through 11, 2015. 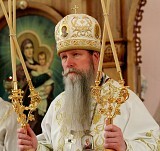 The clergy and faithful of the Western American Diocese congratulate their Ruling Bishop, His Eminence KYRILL Archbishop of San Francisco and Western America, with his Names Day with his Names Day on the day of commemoration of the Holy Equal-of-the-Apostles Kyrill Teacher of the Slavs (14/27 of February). With great affection and respect we wish His Eminence health of soul and body, strength and wisdom to govern the Western American Diocese, and Many Years! The VIII Annual Saint Herman’s West Youth Conference was held at Saint George Russian Orthodox Church in West Jordan, UT, near Salt Lake City, from December 22 to 26, 2014. Around 25 participants of the Western American Diocese gathered from California, Colorado, Oregon, Utah and Washington along with many clergy under the direction of the Youth Department Chairman of the Western American Diocese Archpriest Boris Henderson. On February 8, 2015, this very special day for our parish, we were visited by His Eminence KYILL Archbishop of San Francisco and Western America who also presided over the Divine Services. The 16 of February, 2015, Matushka Vera Dombrovsky reposed in the Lord in Novo-Diveevo, NY. Born in 1918, newly-departed Matushka Vera was married to Archpriest Nikolai Dombovsky. Father Nikolai, who reposed in the Lord in 1979, served as a priest in Poland, Chili, Cuba and San Francisco, CA. Both Father Nikolai and Matushka Vera were very energetic in the building of the New Cathedral of the Mother of God “Joy of All Who Sorrow” on Geary Blvd. in San Francisco. Simultaneously, Father Nicholas labored in the formation of youth, being an active member of the Saints Cyril and Methodius Gymnasia at the New Cathedral. He also compiled an in-depth, historical jubilee album for the Cathedral community when it celebrated its 50th Anniversary. His Eminence Archbishop Kyrill visited Russia from January 27 to February 3, 2015, in order to participate in 6th Anniversary of the Enthronement of His Holiness Kirill Patriarch of Moscow and All of Russia and for a Archpastoral Conference. The Bishops’ Conference of the Russian Orthodox Church took place on February 2-3, 2015, at the Church of Christ the Saviour in Moscow. It was chaired by His Holiness Patriarch Kirill of Moscow and All Russia. On 3 February 2015, the Bishops’ Conference of the Russian Orthodox Church completed its work in the Hall of Church Councils at the Church of Christ the Saviour under the chairmanship of His Holiness Patriarch Kirill of Moscow and All Russia. On Sunday March 8th, 2015, under the direction of Choir Master Vladimir V. Krassovsky the Pontifical Choir of Holy Virgin Cathedral will perform the concert "Sacred Choral Music of Russia." The concert is scheduled to begin at 2:30 pm at Star of the Sea Catholic Church located at 4420 Geary Blvd., San Francisco, CA. 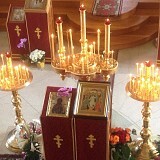 On the 1st of February, 2015, the Sunday of the Publican and the Pharisee during the Divine Liturgy in the midst of a multitude of bishops of the Russian Orthodox Church as well as bishops from many Local Churches who were gathered to celebrate in the 6th Anniversary of the Enthronement of His Holiness Kirill Patriarch of Moscow and All of Russia and for a Archpastoral Conference, His Eminence Archbishop Kyrill was awarded a “Patriarchal” Panagia for His ardent archpastoral labors and in connection with His 60th Birthday. On the Feast of the Nativity of our Lord Jesus Christ His Eminence Archbishop Kyrill ordained monk Peter (Karakozoff) to the rank of Hierodeacon.